The Secret to an Effective Long-Term Strategy is not Complexity... it's Simplicity and Focus. Get 7 Free Ruthless Focus Lessons to Focus Your Organization and Get the Edge! Why do so many companies seem to stall and stagnate while a relative few grow and prosper? What are the ingredients that combine to give some really successful growth companies long-term sustainable advantages? Why aren’t more companies like them? Why do some organizations have great promise at the beginning but they quickly plateau? Does anyone stay small on purpose? Success and growth are not inevitable. In this book, you’ll read about some companies who have been successful for decades. And you’ll learn what sets them apart from the competition. We call it “Ruthless Focus.” We’ll show you companies that are successful for years by maintaining a Ruthless Focus on a single, simple, core strategy. Ruthless Focus drives out temptation and distraction. Ruthless Focus helps you concentrate your time and resources and people and innovation on coming up with ways to be grow profitably, and to design your organization to make it work. Long term competitive advantage and profitability aren’t usually the result of a super-sophisticated strategy. They usually don’t depend on a radical technological innovation or a patentable idea. Instead, we’ll show you a number of profitable growth companies that build their success on business basics. They create a simple core strategy. They stay with that core strategy until it doesn’t work. They make sure the non-essential parts of their processes are eliminated, and they concentrate on continuing to build their organization around their strategy. Here are some of the key things you’ll learn from Ruthless Focus. What two questions you need to ask and answer to determine your strategy. The four tests your successful strategy must meet. Why you’re likely to hit a bump in your growth curve and how to power past it. The Five basic strategies you can use as models when you craft your own. 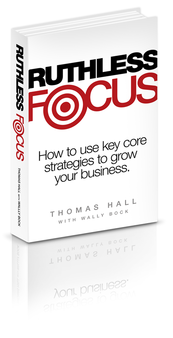 In Ruthless Focus, Tom Hall and Wally Bock share the stories of more than twenty-five businesses. Stories are how we learn best. And stories are the best medium for showing you what works and what doesn’t without limiting your creativity with too many rules. Unlock The Business Strategy That Has Already Helped Countless Businesses Generate Higher Profits.